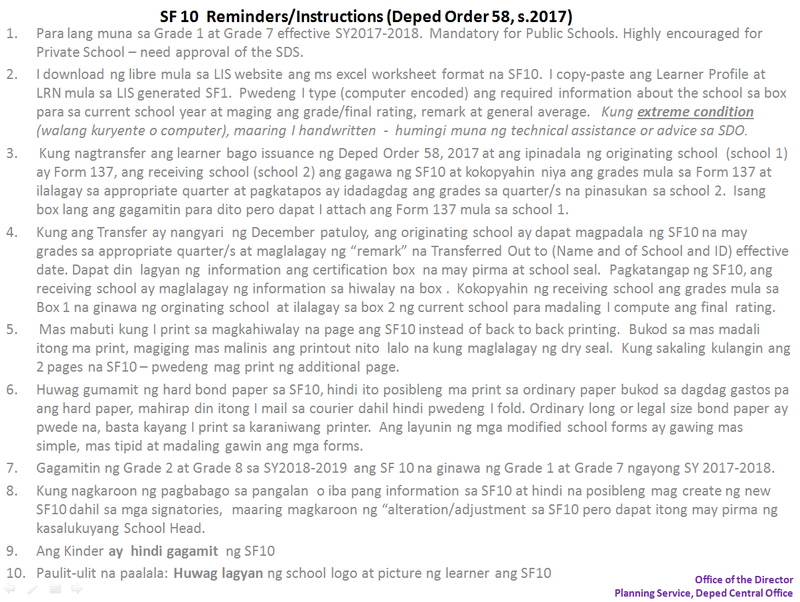 For SF10 important reminders/instructions, kindly click this link. Please be reminded that DepEd has authorized NEITHER the usage of such “forms” NOR their sale to our schools. Official School Forms can be downloaded for FREE and are EXCLUSIVELY available for schools* at the Learner Information System (LIS). Report any incident of unauthorized use and sale of School Forms to theLIS/EBEIS Helpdesk, the Planning Service, and the Office of the Undersecretary for Planning and Field Operations. **	As per DepEd Order No. 58, s. 2017 (Section VII: Special Provision) released on 27 November 2017. Starting 25 October 2017, all facilitators of the Alternative Learning System (ALS) can start encoding their learners in the LIS for Beginning of Calendar Year (BOCY) 2017. You may encode and register ALL ALS LEARNERS who attended learning sessions from January 2017 to present. If the learner is no longer attending classes to date, update their status after encoding them to Completed or Not Completed (see definition in DO 44, s. 2017), as well as the status date (the date when the learner stopped attending classes. Finalize the class one you have completed updating ALL its learners' statuses. Link to the tutorial can be read and downloaded here. Starting 1 July 2017, please send all LIS- and EBEIS-related queries, issues, and correspondences to the LIS/EBEIS Helpdesk’s new email address, support.ebeis-lis@deped.gov.ph. All other non-system issues will still be received at the ICTS-User Support Division’s official email address at icts.usd@deped.gov.ph. In compliance with prevailing laws and policies on data privacy and safeguarding, users must NOT post LIS screenshots or messages containing Learner Reference Numbers (LRN), names, documents, enrollment histories, and/or personally-identifiable information of learners in Facebook or any publicly available social media network, regardless of the settings of the post, group, or profile (Closed, Secret, etc.). Such information is HIGHLY CLASSIFIED, and must NEVER be posted under any circumstances on social media. If you must post follow-ups to other schools, however, and screenshots or information is essential, please redact (omit, erase, block, or blur) any learner information prior to posting, or at least send through private messaging or email. All posts not complying with this rule constitute violation of relevant policies, and will be taken down ON SIGHT and WITHOUT WARNING. Before viewing a tutorial demo for a specific module, kindly watch this video first for an overview. Click here to watch. Listed below are the topics included in the video. Click here to watch the tutorial. Closed during weekends and national holidays.